Permeable paving, also called pervious paving or “porous pavement”, is a term used to describe paving methods for roads, parking lots and walkways that allow the movement of water and air through the paving material. Although some porous paving materials appear nearly indistinguishable from nonporous materials, their environmental effects are qualitatively different. Their effects are important because pavements are two-thirds of the potentially impervious surface cover in urban areas. Permeable paving surfaces are highly desirable because of the problems associated with water runoff from paved surfaces. Part of the problem is creating an unnatural volume of runoff from precipitation, which causes serious erosion and saltation in streams and other bodies of waters and also the washing off of vehicular pollutants. Permeable paving surfaces keep the pollutants in place in the soil or other material underlying the roadway, and allow water seepage to recharge groundwater while preventing the stream erosion problems. They capture the heavy metals that fall on them, preventing them from washing downstream and accumulating inadvertently in the environment. In the void spaces, naturally occurring micro-organisms digest car oils, leaving little but carbon dioxide and water; the oil ceases to exist as a pollutant. Rainwater infiltration through the pavement into the underlying soil reduces stormwater volume and restores natural subsurface flow paths. The cost of porous pavement, with its built-in stormwater management, is usually less that that of an impervious pavement with a separate stormwater management facility somewhere downstream. 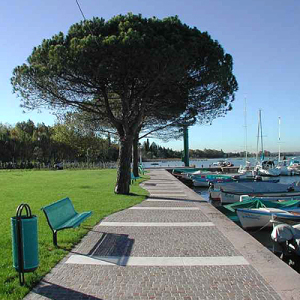 Porous pavements give urban trees the rooting space they need to grow to full size. A “structural-soil” pavement base combines structural aggregate with soil; a porous surface admits vital air and water to the rooting zone. This integrates healthy ecology and thriving cities, with the living tree canopy above, the city’s traffic on the ground, and living tree roots below.